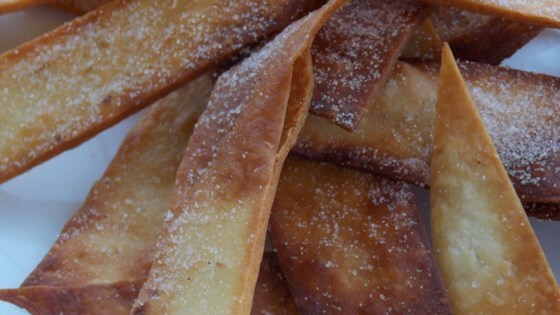 "Flour tortilla strips are deep-fried then coated with cinnamon and sugar for a quick, crunchy snack." Combine sugar, cinnamon and nutmeg in a large resealable plastic bag. Seal and toss to mix. Heat oil in deep-fryer or deep skillet to 375 degrees F (190 degrees C). Fry 4 or 5 tortilla strips for 30 seconds on a side, until golden brown. Drain on paper towels. While still warm, place fried tortillas in bag and shake to coat with sugar mixture. Serve at once or store in an airtight container. This is a great way to use leftover tortillas. My son devoured them! Reminded him of his favorite cereal Cinnamon Toast Crunch.